I was on vacation when I heard the news. We were driving to the beach and the NPR station was in the middle of a piece about good old JD when I turned it on. Somebody was blathering on about how Franny and Zooey was the best of his works. That always riles me. Me – “I wonder why they are talking about Salinger…” I’m sure my tone was edged with something like irritation. I knew that he was 91 and cantankerous to beat the band. I knew he was the guy that inspired crazies, endless speculation and the literary lust in many. Yet I cried. I’m not ashamed to admit it. Despite enduring many a dismissive glare when I would announce how much I loved Raise High the Roofbeams, Carpenters and Seymour an Introduction I still love it. 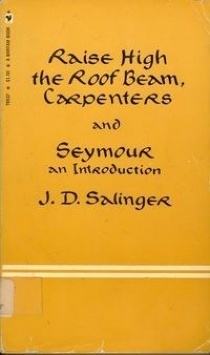 Chris Wilson has a great article in Slate about why Seymour an Introduction was Salinger’s best work. Most of the articles I’ve read in the last week, since returning from vacation, have focused on Salinger as the voice of adolescence. Many have commented that they grew out of J.D. Salinger. I picked up my well worn copy of his last book and realize that these people have never read it. Because it isn’t the kind of work you grow out of. You read it again and again and marvel at the layers, at the complexity of character and most of all how someone so personally damaged could write something so beautiful and true. I cried too. There will be no miraculous interview where he finally explains himself. I wonder what's lurking in his apartment? I'm so sorry about your grandmother. She was far too young. I'm 70 myself this year, and I'd like to think someone in my own family is connected well enough to reflect as poignantly about me some day, as you did in your piece about her. Thanks for your kind words, Fran. Yes, I was hoping for that interview one day too. Or long meandering essay published in the New Yorker. I'm holding out hope it sits in a filing cabinet somewhere.